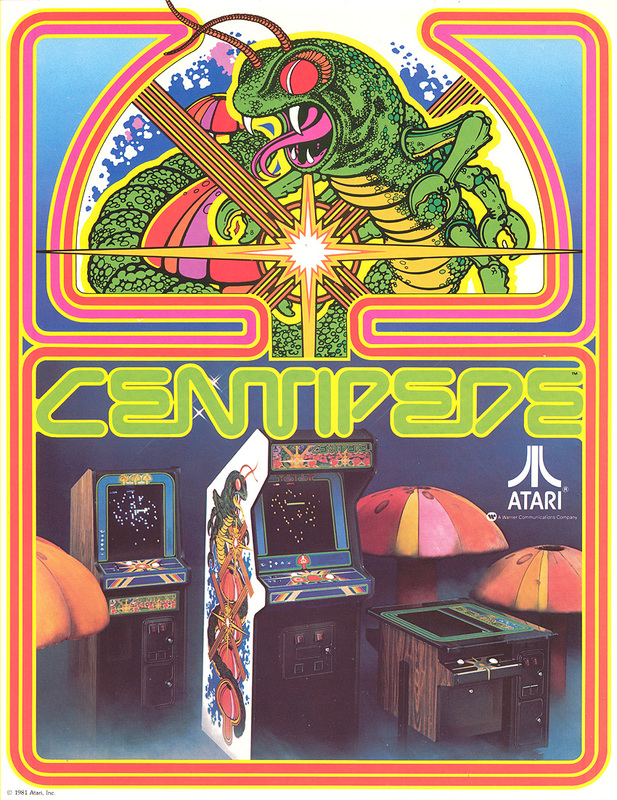 Centipede was and still is a great Atari classic that utilized a 2 1/4'' track ball with one button to fire. 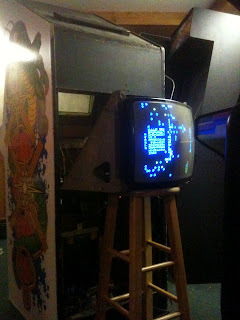 It also had Atari's cone buttons also known as volcano player one and player two start buttons. 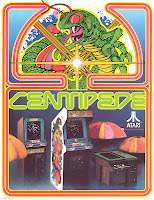 The game has a centipede that makes it's way down the screen your goal is to destroy it completely to move to the next round which is essentially the same thing with increased difficulty and the background colors change. You have mushrooms that you need to destroy that get in your way along with a spider, and other various bugs. 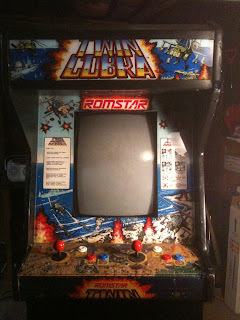 When I first got the cabinet it was converted to a "Twin Cobra". Romstar's Twin Cobra was a kit game so it found it's way into various dedicated cabinets, I decided to convert this back to it's original glory which was a centipede. Here you can see the Centipede that was converted to a Twin Cobra. The good news is that I paid next to nothing for the cabinet, and luckily had a working CRT, and Twin Cobra PCB that I would later sell to get money for this project. 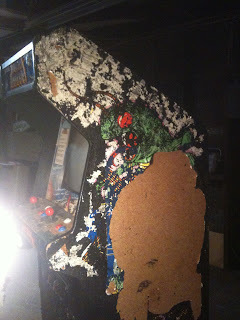 I ended up selling all of the Twin Cobra Parts the marquee, bezel, pcb etc.. Unfortunately the control panel needed to be replaced since it was drilled too many times. 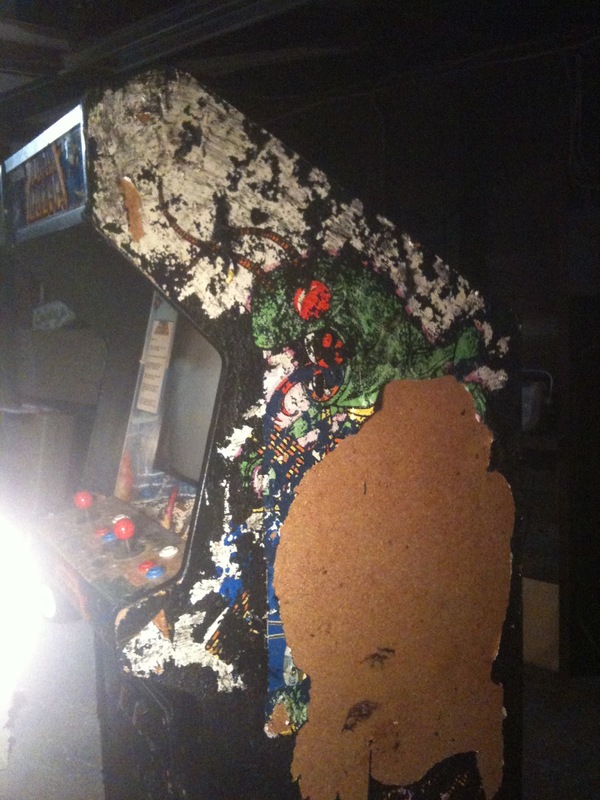 Other parts that needed to be required to convert this back was the Centipede PCB, Marquee,Bezel, Cardboard Blue Bezel, Control Panel, Control Panel CPO, a Track Ball Rebuild Kit, and lastly Side Art. The game was already wired for JAMMA so I decided to keep it that way since I heard many problems existed with the original Atari Linear Power Supply. While waiting for the parts to come I decided to strip the black paint off the sides of the cabinet sure enough I was right this was at some point in it's life certainly a centipede. The art on the other side was completely missing so I decided to completely go down to the bare I think It's particle board or pressed wood it's not plywood that's for sure. Once I got it down to that point I sanded, primed, and painted it white. The parts came in and looked great. It was looking more and more like a Centipede. Since I was keeping it JAMMA I needed to obtain a JAMMA Adapter, I remember it was tough matching up the p1 up,down,left,right to correspond to the track ball movements properly but eventually all was working. Once the controls were working the track ball still needed to be rebuilt. Basically 6 new bearings and 3 new rollers, in addition to a new 2 1/4'' snow white track ball made it rolling smooth again. I can't emphasize enough how installing a new rebuild kit for the track ball has such a massive impact. I was testing the monitor outside of the game to make sure it was working properly before installing. As a side note I find that the best way to get these machines into a basement is to reduce the weight as much as possible. You want to pull the monitor, glass bezel, back door, sometimes even the control panel, and not a bad idea to remove the PCB for protection. After everything was installed it's really hard to tell this game was ever a Twin Cobra. I'm glad I was able to restore this game to it's original glory. Below is a photo of the end result.